Looking for a new Slow Cooker? There has never been a better opportunity to purchase a new Crock Pot or Slow Cooker. With dozens of different manufacturers producing a plethora of different models, you’ll be able to find the perfect appliance for your needs. Time and time again, we’re asked the infamous question, “What is the best slow cooker?“. Unfortunately, it’s entirely down to you and your needs, and not to mention your budget. Typical Slow Cookers range from $20 – $200, and as with anything in life, the more you pay, the better quality you’re going to get. Fortunately for you, we’ve compiled a list of our top Slow Cooker Reviews to help you make an educated choice. 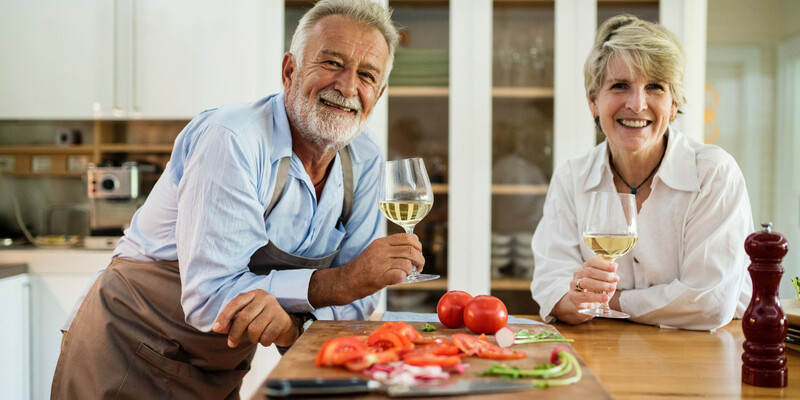 Cancel your reservations for the night and enjoy a home cooked meal at home without having to make it. 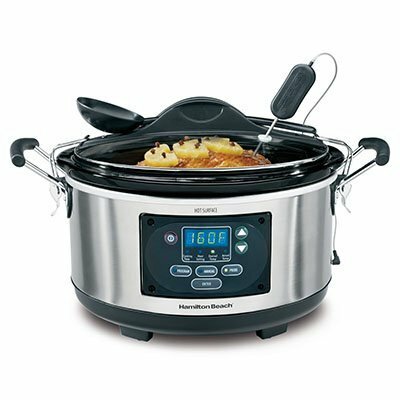 The Hamilton Beach 33967 programmable slow cooker can cook on your behalf, while you are away and serve delicious hot steaming food by the time you return. Making dinner time less taxing, it offers three modes of cooking namely, a manual mode, probe mode and a program mode. For days when you are busy, just set the program mode, select your choice of recipe and get cooking. All you need to do is prepare beforehand by cutting up the meat, slicing veggies, sautéing ingredients and such. For meat recipes that need precise temperatures to cook well, you can use the probe mode along with the probe accessory. Once the desired temperature is reached, this slow cooker will shut off and switch to an auto keep warm mode. Its a perfect combination of traditional slow cooking with modern advancements. In fact, just like traditional slow cookers, you can set the temperature to low, high or medium and set a time. Now if you prefer cooking for parties and pot lucks, the Hamilton Beach 33967 will let you take along meals on the road. Having a travel friendly design, the lid secures with a clip and latch to the cooker with a tight seal, preventing anything from dirtying your car. Slow cookers are our favorite kitchen appliance for a reason. Unlike a pressure cooker or a rice cooker, where you have to be present during the preparation and cooking stage, a decent slow cooker eliminates the need to stand around. In the two weeks that we have had the Hamilton Beach 33967, we seldom ever spent time around the slow cooker unless it was for preparation purposes. Since this particular model is 6 quart capacity and comes with a probe unit, we never felt the need to slice and dice meat into tiny pieces. In fact, making meat recipes was much easier for us in this cooker than ever before. Why, you may ask? Well because the large size let us put in a large cut of meat and the probe let us cook the meat until the inside of it reached a particular temperature. And best of all, once cooking completes, either because the timer runs out or because the probe reads the established temperature cutoff, the Hamilton Beach 33967 automatically switches over to the keep warm mode. 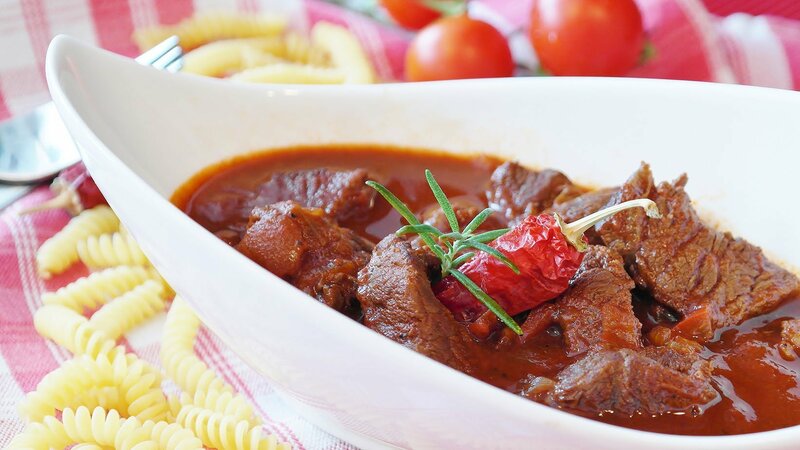 In this mode, food is not heated but is maintained at a simmering temperature, which will not overcook food. It can continue warming food for a total of 12 hours, which in our view is more than enough. Design wise, all the buttons are ergonomically placed around the central LCD display panel from where you can select either of the three modes and set in a delay timer too. Moreover, under the preset function, it lets you select a programmed dish and leave it as such with the ingredients added into the slow cooker’s stoneware pot. Reading through the instruction booklet, we found plenty of sound advice on what to do and what not to. However, it was the recipe section that made our day. Detailed, with pictures and directions, the recipes are mighty easy to replicate and being geared specifically for the Hamilton Beach 33967 and 33966 models, it lets you make dishes without any extra effort. We particularly loved its simple nature. Not at all hard to clean after use, plenty of programmed features to automatically select and cook with and a large 6 quart capacity are a few of the things we appreciated in the Hamilton Beach 33967. And, the one thing that we found lacking in this slow cooker was the design of the lid. Although it has clips on it and is supposed to be transport friendly, too much movement seems to spill a bit of the recipe out of the vent. 110 Volt operation with 6 quart capacity and LED digital panel. Three options of cooking with automatic keep warm feature – probe mode, manual and program mode. Clip on spoon, tight sealing lid design, dishwasher safe components and user manual with recipes provided. Stoneware pot and tempered glass lid. As far as slow cooking goes, the Hamilton Beach 33967 couldn’t have been made any better. Its got the right technology, gear and power input to work wonders with any recipe. Plus being a probe based design, it is definitely better at cooking meat recipes. For those who prefer cooking in the traditional manner, its got an option of selecting, high, medium and low heat with a timer. And for those who prefer not using their heads too much, preset options will take care of their needs too. Overall, the Hamilton Beach 33967 appears to be a worthwhile investment with sufficient features and benefits. The Cuisinart MSC-600 3-in-1 Cook Central 6-Quart Multi-Cooker is not just your average slow cooker but also a multi-cooker by design. Its a kitchen chef on its own with programmable controls and functions that let you do more than just cook. You can saute ingredients, brown meats and prepare all your favorite recipes in a single pot. It features a 6 quart oval design with non-stick coating on the inner pot that lets you saute and brown with ease. Moreover, once cooking is done, it switches to the keep warm mode automatically letting you serve up straight from the pot. Cleaning up is also easy thanks to the steaming rack, pot and lid all being dishwasher compatible. In the slow cooking option, you get a choice between high, low and simmer temperatures. This is ideal for preparing varied recipes, some that need to sit for over 10 hours and others that must be cooked in under 3. Moreover, a 24 hours delay timer takes care of when you want to start late. With the steaming rack, you can steam your greens and even prepare shrimp, fish and what not. Just add 2 quarts of water or any liquid that you choose, cover the lid and let the steaming complete. The Cuisinart MSC-600 also sautés and browns as mentioned before. Whether its a skillet dish or a simple family recipe, choose to saute or brown at 350 degrees until ingredients are soft, perfect and ready. Our first item on the menu was a pot roast for the Cuisinart MSC-600 3-in-1 Cook Central 6-Quart Multi-Cooker. It wasn’t our first time and so we knew exactly what to do. Having read through the manual for this slow cooker, understood its temperature settings and various functions, we decided to go ahead and brown the meat, braise it directly in the slow cooker and cook till finish in it. The end result was a wonderful taste and splendid texture. Best of all, cleanup was rather easy after we devoured the roast. It is definitely worth purchasing since many crock pots in the market have failed to deliver when they tend to multitask. The Cuisinart MSC-600 however doesn’t seem to fail at either of its triple functions. We feel that this slow cooker is capable of managing three to four uses in a week. Although it is a slow cooker, by no means, does it take ages to complete. In fact, the low temperature setting is just high enough to complete most delicate tasks in under 5 hours. And as for the high temperature setting, its like cooking at 375 to 400 degrees F. This is why the Cuisinart MSC-600 can cook recipes in under 3 hours at high temperature setting. Plus, its kind of attractive looking with its sleek outer stainless steel surface and pot insert. The glass lid with handles, additional handles on the crock pot and the bottom positioned control panel all give it a futuristic appeal. In fact, its not all design with this slow cooker. For starters either of the handles never get hot and neither does the rim of the glass lid. This is great as it means you can carry it to the dinner table the moment its done cooking. Moreover, washing it is not at all hard. Although the use of non-stick coating means that you can’t really use a dishwasher, at least cleaning it by hand does not take much time. Plus dried food seems to come off real easy without any scrubbing necessary. If we were to highlight its one standout feature, we would definitely go for its browning and sauteing multi-function We never have to dirty other dishes, take out the skillet to brown or braise meat. Moreover, we did not find anything in particular that we disliked. It is well made, designed to perform and has a long warranty coverage to satisfy the most cautious of buyers. LCD backlit display with temperature and timer readouts. Cool-touch handles on the glass lid help in easy handling. Think of a slow cooker and you immediately realize all the preparation that goes into making a dish in it. Now, the Cuisinart MSC-600 3-in-1 Cook Central 6-Quart Multi-Cooker differs in this respect as it manages to multitask as a skillet and steaming machine. So, instead of using too many dishes and ending up cooking in the slow cooker, you prepare all your preliminary ingredients right in the slow cooker’s stoneware pot and then add in all remaining ingredients, cap the glass lid and set the cooking time with appropriate temperature. It’s easy, simple and effective. Whether you plan on making a 7 pound large roast or a huge batch of soup for a large family occasion, the Crock-Pot SCVT650-PS programmable slow cooker will be more than sufficient with its 6.5 quart capacity. The touch screen control panel provides easy access to all the controls of the crock pot such as low cook setting, warm and high cook setting. This is its temperature selection range. Then there are time setting options, start button and up/down time selection switches with a power icon and power switch. The delay timer can operate up to 20 hours late and starts from 30 minutes. It comes with automatic shut down and keep warm modes. With ample amount of delay timing, you can cook overnight, refrigerate leftovers in the morning and tuck in at night. The size and its features let the Crock-Pot SCVT650 prepare food for a large family once for the entire day. Its the perfect solution to a busy life. Auto keep warm lets the food simmer until you return home, maintaining its texture and flavors without burning it. Design wise it features a metallic finish with metal side handles fitted with silicone for comfortable and secure gripping. The shape is oval to accommodate a large cut of meat with ease while the lid and stoneware pot make it easy to clean and serve with. Our experience with the Crock-Pot SCVT650-PS has been good. This is not your average slow cooker that is unusable in the low temperature setting nor is it too high at the high temperature setting to burn any recipe. It doesn’t feature a hinged lid and neither is it expensive. These according to us were the standout features in this slow cooker. Having experienced cheap supermarket grade slow cookers in the past that managed to nuke our food, we wanted something a bit more beefy, with more juice and reliability than before. Now in our three weeks of experience, we came across plenty of pros and few cons for the Crock-Pot SCVT650-PS. First, if you set the unit at low, then expect a simmering of dishes, which is actually perfect for recipes such as dahl, curries and Indian lentils. The low temperature setting is also useful for making Chili Verde, Beef stew, soups, stocks and even baked beans Usually, on the low setting 10 hours or so cooking time works well. Since food cooks very slowly at this setting, there is no chance of getting hot spots, burns and sticky food. Moreover, the stoneware pot does seem to dissipate heat evenly, regardless of whether you use it in the low or high temperature setting. Plus, its stainless steel styling does bode well with our modern looking metal filled kitchen. At least, it doesn’t look flimsy like many other brands. Coming to things that need a bit of improvement, the control pad isn’t exactly user friendly. Numbers are kind of hard to read and you need to look at it closely to figure out what settings have been used. Moreover, being digital in nature, the heat from the unit may damage the circuits after a while. Not sure if this will ever happen but we have witnessed this in other models. Besides, the pot does seem to heat up quite a bit when used extensively. Although its not much to worry about, you may want to keep your fingers protected by sticking to the handles only. Thing is there aren’t many other slow cookers for under $100 like the Crock-Pot SCVT650-PS that features a good quality construction, decent functions and good customer support. 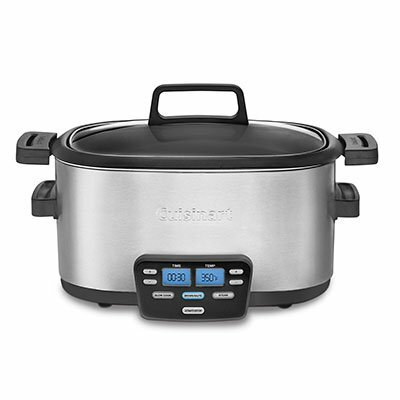 So, overall its definitely a dependable and useful slow cooker to have around. 6.5 Quart capacity, removable stoneware pot with oval design. Not everyone is used to slow cooking. Those who have tried this art usually end up making recipes on the stove-top simply because of the time it takes. Now the Crock-Pot SCVT650-PS does not really make things fast. In fact, for a slow cooker it takes a lot more time than usual. 10 hours on low setting and 4 hours on high setting is kind of snail pace. However, this also means that food never really gets burnt, stuck to the pot surface or develop hot spots. Hence, folks who enjoy slow cooking and recipes particularly designed for crock pots will definitely love this equipment. Its also a good starting point for people learning the art of slow cooking as the chances of going wrong are limited with the Crock-Pot SCVT650-PS. Remember that what you read on the box or in advertisements is in most likelihood not exact. So a six liter slow cooker might have 4 and half liter capacity in reality. However, slow cookers on an average provide around two thirds of the total stated capacity to users. Using this norm, you should evaluate the size or capacity ideal for your requirements. 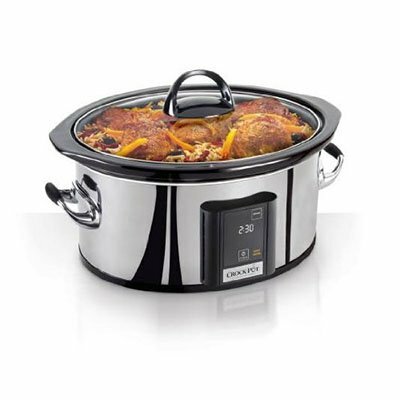 Removable Pot – This is a must have feature today in all slow cookers. It lets you clean up easily afterwards and even transport your creation to the dinner table or to a pot luck party. Temperature Settings – Not a vital requirement but its nice knowing what temperature the slow cooker is set at. This is great for recipes that call for a specific temperature to bring out subtle taste differences. Cooking at varied temperatures for different time periods is only possible if your slow cooker has precise thermostat and temperature settings. Programmable Cooking – Whether its for one hour or many hours, having the ability to program a slow cooker on the total time of cooking lets you concentrate on other stuffs in life. This feature saves you effort and time. Once you add in the ingredients, set the timer and program the slow cooker operations, you can leave it as it is. When its done cooking, it will automatically switch to the keep warm feature, maintaining high temperatures to resist bacteria formation and preserve the taste.